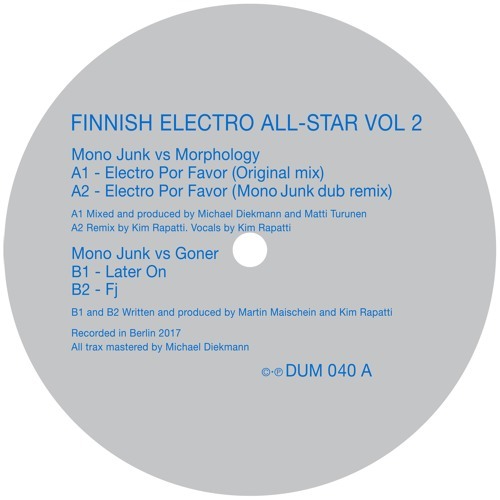 VINYL still available: https://www.juno.co.uk/products/mono-junk-finnish-electro-all-star-vol/701307-01/ https://hardwax.com/…/vario…/finnish-electro-all-star-vol-2/ clone.nl/item52600.html https://www.deejay.de/Various_Artists_Finnish_Electro_All-Star_Vol_2_DUM040_Vinyl__329478 https://www.redeyerecords.co.uk/vinyl/100643-dum040-finnish-electro-all-star-vol-2-va https://www.levykauppax.fi/single/goner/finnish_electro_all_star_vol_2/ Kim Rapatti a.k.a Mono Junk presents the second volume of Finnish Electro All-Star on his DUM Records imprint – active since 1992. The new release is the latest chapter of Mono Junk collaborating with friends, recently with Mesak and Freestyle Man. The A-Side of Finnish Electro All-Star (DUM-040) features collaborations with top Finnish electro duo Morphology, who recently released an outstanding album on Firescope label. Electro Por Favor is a pulsating driving electro track with a killer bassline and vocals by Rapatti – Electro at its best. Raw, apocalyptic, solitary remix by Mono Junk follows the original. The B-Side features collaborations between Mono Junk and a very special guest: Goner a.k.a. Martin Maischen, who is known from many hot releases as the other half of German electro act Sandbenders. They were at most active around the millennium and made releases for Force Inc. Music Works and Science City. The two included tracks are deep electroid techno excursions made last year in Berlin. Vinyl release date is 24 th of September. Is this getting a digital release or vinyl only?